You’ve not been somewhere before you document it or take pictures as authentic proof that you’ve been somewhere special and let your friends know about it. In addition to taking selfie in front of a statue or a building that is well-known trade mark of a city, you can use snapchat to show your existence in a city by apply geofilter on your photos. Geofilter is filter overlays for your photos on snapchat, it’s like a stamp, a transparent image that is attached to your selfie photo. This filter is somekind like a form of writing or an art work that represents a city. Geofilter of a city can only be used when you actually are in that city and verified by snapchat. So you can not cheat on it, if you’re in Vegas, only geofilter Vegas that you can use. This makes geofilter on snapchat be an authentic proof that you have been in a particular city. Geofilter are actually user-created content, you can submit your own homemade geofilter to snapchat, if they approved it, all folks who visit your city will be using geofilter you create. We will discuss how to submit your own geofilter later. As discussed previously, geofilter can be used when you are in a particular city, that mean snapchat must know where the location you are. 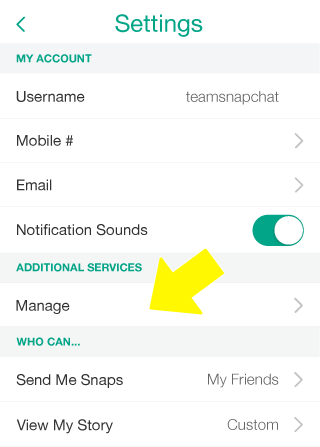 In order to be able to know where you are, you must enable location on your device, if you are using iOS devices, activate it from Settings > Privacy > Location Services and turn on for Snapchat. For Android users, you can do it on Settings > Location > Turn it on. 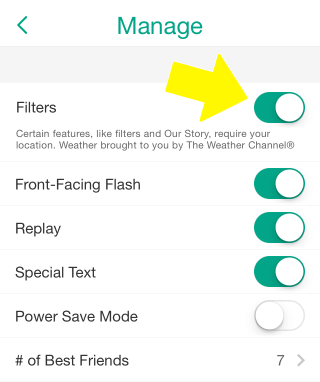 Then you will see a slide button next to “Filter”, swipe it to turn it on and enable filters on snapchat. After you taking a selfie or a picture, swipe it to right and you will know where are you and which geofilter you can use. Sometimes we occasionally have to try to be a creator, do not always use the work of others and just be consumers. With snapchat’s geofilters, you can be a creator whose work is used by a lot of people, maybe it is not a science inventions, but it can became one of small things you can be proud of. 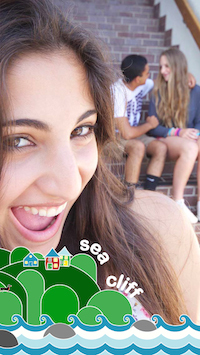 There are several requirements to submit your own geofilters on snapchat. The image you create should be in PNG with a transparent background. PNG image that you send should be saved as web-optimized with a width of 1080px and 1920px height. The file you send must not exceed 300KB. For the purposes of making geofilters, snapchat has prepared templates that are available for Adobe Illustrator and Photoshop for you though. When your geofilters are ready, you can upload it here, you need to fill some additional informations such as your name, email address, and a description about the place you make it as geofilters. Snapchat team will review your submission, and if they approve it, they will let you know by email. Now you are ready to use geofilters on snapchat, and if your geofilters are accepted, let your friends know about it and let all folks in the neighborhood use your geofilters.